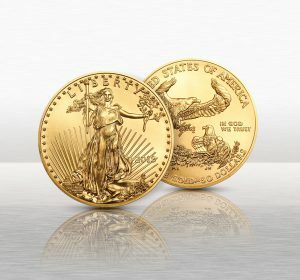 Gold coin buying turned frenzied in May, as sales of American gold coins skyrocketed by a stunning 433% in May from April, according to U.S. Mint data. May gold coin sales marked the highest level since 2015, as investors used the lower price levels as an opportunity to increase physical gold ownership, amid a time of rising geopolitical and economic tensions. In May, the U.S. Mint sold 24,000 ounces of American gold eagle coins, up from 4,500 ounces in April. Premiums, or the different between the gold coin and spot gold prices is historically narrow right now, about 1-1.5%. That creates great buying opportunities for investors. Spot gold prices slid since mid-April, pressured in part by a rising U.S. dollar and an initial jump in the 10-year Treasury yield. However, 10-year rates have slumped sharply in the past few weeks. The recent price dip toward the $1,300 an ounce in gold may be bottoming out. Why? Chinese and Indian buyers tend to be "price sensitive," which means they tend to wait for price retreats to buy. The $1,300 an ounce level in gold is viewed as a good buying opportunity, which should attract physical buying from these two gold hungry nations. The U.S. dollar is expected to fall back, which in turn, should help gold prices recover. One factor that could weigh on the U.S. dollar are the rising concerns over the economic impact of a Trade War, which could derail expectations for a couple more Federal Reserve interest rate hikes in 2018. Increased interest in gold as an inflation hedge.S. inflation data and more importantly future inflation expectations have steadily increased since the start of the year. That increases demand for gold to hedge against the corrosive impact of higher prices on goods and services. Gold typically climbs during periods of rising inflation, which helps to protect purchasing power of one's assets. The swift jump in American Eagle gold coins during May could just be a taste of what's to come this year. Professional money managers turn to gold during times of economic uncertainty, crisis and rising inflation. The 2018 run toward gold may just be getting started. Is your portfolio fully protected?